Seated: Guy Kawasaki (left) and Gil Asakawa. Standing (from left): AARP staff members Ron Mori, June Kao, Daphne Kwok (vice president of multicultural markets and engagement, Asian American and Pacific Islander audience) and Ruma Samdani. 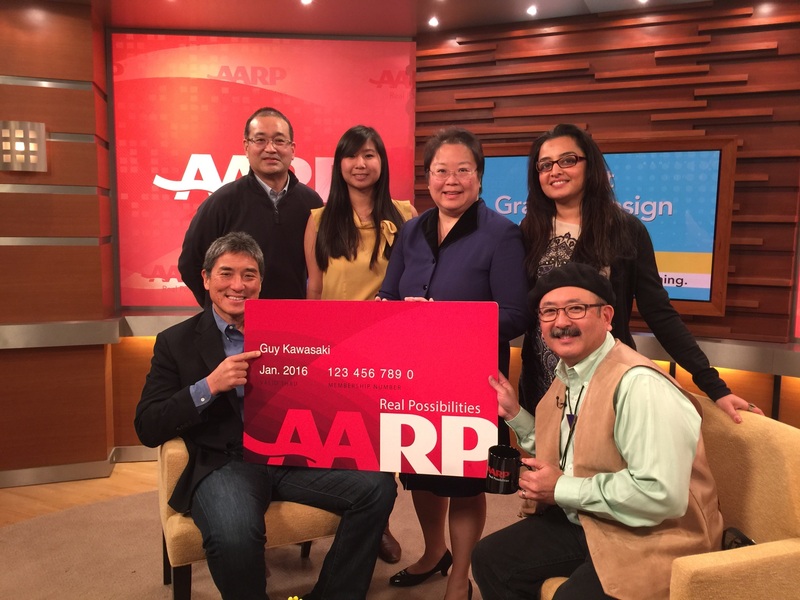 WASHINGTON – Technology entrepreneur and writer Guy Kawasaki is teaming up with AARP for a new web series about how people who are 50-plus can embrace technology. Debuting at www.aarp.org/guykawasakivideos, “Technology: It’s Not Just a Guy Thing” takes a look at how technology can empower people of all ages and change their lives. Hosted by Gil Asakawa, AARP/Asian American Journalists Association Social Media Fellow, “Technology: It’s Not Just a Guy Thing” will focus on the art of innovation, social media, the fundamentals of graphic design, and how digital media is changing the way we consume information. New episodes will premiere every three weeks until the end of March. Kawasaki is the chief evangelist of Canva, an online graphic design tool. Formerly, he was an advisor to the Motorola business unit of Google and chief evangelist of Apple. He is also the author of “The Art of Social Media,” “The Art of the Start,” “APE: Author, Publisher, Entrepreneur,” “Enchantment,” and nine other books. He has a BA from Stanford University and an MBA from UCLA as well as an honorary doctorate from Babson College.